Staying supple and fit is an intricate part of being the best rider you can be. Having a trainer that understands the job required of you as a rider is for me extremely important. Without Marie’s expertise and technique, I don’t think I could achieve my goals to the level I expect of myself. Marie’s workouts are simple, effective and her standards are extremely high. Her positive approach helps me on days when it’s not as easy as I would like it to be, but the strength and balance she has given me enables me to do my job as a rider even when the going gets tough! I highly recommend Marie for anyone looking to compliment their everyday riding with exercises that will improve your strength and balance. Thanx Marie, looking forward to when you can come Down Under again! I was a beginner when I first started riding with Marie 8 years ago and I’m now preparing for my first Grand Prix. Marie’s committed and focused coaching has been instrumental in helping me reach my riding goals. Six months ago I started fitness training with Marie. She has developed a custom workout program to strengthen and improve my riding position in preparation for Grand Prix competition. I can already see and feel the results. Best of all, I train hard with Marie, and enjoy every minute of it! Marie taught me how to ride and how to be fit and in shape for riding- both in a way that made it fun for me. She also helped me find an amazing horse that who was just right for my level and who was my partner in winning at shows! Marie is great!!! When I moved from the UK nine years ago, Marie was the first dressage instructor I met and I have stayed with her ever since, as she has a great way of communicating her teaching skills with her pupils. She is a very accomplished dressage rider and has had amazing training herself, that she can then pass onto her clients. My discipline is eventing so the dressage portion is of great importance and the only way to obtain consistent scores is to have the right teacher for the horse and rider and in my case Marie is that person. She understands the importance of two communication during the lesson and is happy to tape our sessions and discuss with me afterwards so I can develop the areas where I am slightly weak and can improve on. Marie is a natural teacher and always comes with a smile on and will always have a positive message from a lesson, even if the session hasn’t gone entirely to plan, which is important when we all want to improve and learn!Roll on the eventing season 2013, I hope to make Marie proud! Marie is an extremely motivated fitness trainer. She takes into account the difficulty of each exercise and gives encouragement when needed to make her students get through the pain and gain not only physical but mental strength. I have struggled with exercise options over the past year due to several major ankle surgeries and Marie has shown me how to work through and strengthen what I thought of as a permanent limitation. Because of Marie’s training I have become stronger, fitter and more confident in my abilities. I can do exercises on my ankle that seemed impossible a year ago. I appreciate the dedication Marie shows to everyone she trains and all the help she has given me and my ankle! I had the pleasure of going to train with Marie this fall. I plopped my 17 h Hannoverian in the barn and off I went taking lessons daily! My horse and I could “kinda”… although, after my 3 month stint with Marie ( I live to far away to stay at her barn permanently) I became a RIDER… I now start and ride my own horse. Marie can see and feel what a horse and rider needs needs. I have had this horse for 5 years and now, I REALLY have my horse, I can ride him, I ride him correctly and he’s happy!! !ThanxMarie,I can’t wait to come again!!! I started riding with Marie when I first moved to New York two years ago. Having her as a trainer was a huge step up from what I have experienced in the past. She put myself and my horse on a rigorous training program and improved my riding tenfold over the course of just a couple of months. I honestly don’t even remember the rider I used to be and hope I never go back! Not only did she improve my riding but was able to put my horse in a top training program. She can help advise and advise on anything and everything to which supplements your horse should use, to the right saddle. She’s there every step of the way to make sure you grow and your horse grows at the right pace and level. She makes it easy, comprehensive and most important FUN. She’s always there to help when you are away and trains your horse throughout the week. Her riding has done wonders for my horse and I always know he’s in safe hands. I would also highly recommend her to help you find a horse in the market, she takes her time and makes sure it’s a right fit. She can quickly identify whether the horse is worth it and a good match for you. She has honestly made my dreams come true with riding and allowed me to train and compete at a level I thought would take me many more years to get to! Since I’ve started riding with Marie my confidence and abilities have grown exponentially, Marie explains the “how” in a way that’s easy to follow ( if not actually do!) but also is able to be creative in approaching things in different ways if you ” just don’t get something”. She pushes me when I need it, but gives me the space to figure it out when I’m struggling. Ultimately riding should be a pleasure and Marie always makes it fun- even when you’re learning the difficult stuff. I trust her so much I bought her amazing Grand Prix horse!!! If you are looking for someone who can cover the technical stuff, be all about the horses and still make it fun… then Marie is your woman. No doubt about that. Marie makes our workouts so much fun- I never would have expected to be smiling through the hour, much less laughing with delight. Endlessly inventive, it’s never the same routine twice. There’s no chance to get bored when working out with Marie introducing something new every week! Marie’s classes are not anything like the drudge of a gym workout she uses props in a way I would never have expected, and along with the weights and the balls and the bungee ropes, she makes trees and bike racks and hay bales part if the fun too! Not only are Marie’s classes an hour of solid fun, there are also solid benefits I’m more toned. I’m stronger and she’s helped me achieve a new level if confidence in the saddle and in everyday life! Marie’s workout classes are great! As with her riding sessions, Marie brings expertise, clear instruction and a positive atmosphere to engaging workouts that really yield results both on the ground and in the saddle! Since taking Marie’s classes I’ve been able to use my body more effectively leg, seat and balance all improved! I am so lucky to get to workout with Marie, she is an expert rider and experienced fitness trainer, so she understands how to improve balance, strength, endurance and coordination in ways that riders really benefit from. She creates intense and fun exercises to achieve this, I feel stronger and better balanced in the saddle since starting her classes and continue to enjoy the results! Marie loves her job and it shows. She knows exactly what both horse and human needs to perform better and she tailor her instruction to produce that result. She also makes it interesting and varied , so training never seem like a chore, she is passionate about her work, and she both insists on and achieves great results for her clients. Marie takes great care of her clients and horses, makes sure that both are well-trained and well cared for. I can’t imagine training with anyone else. I have ridden with Marie for several years and she is an exceptional trainer who brings out the best in riders and their horses. She has a great sense of when to push for more and gives clear explanations so you can carry new skills forward when working independently. Marie’s workout classes has taught me to never say never: there were exercises that I was sure I could never do and not only have I been able to do them, but I can see the results! I love how even when I’m injured, I can still do a workout, because Marie’s creativity always allows for one to be able to workout other body parts and when I’m done with each and every class I always feel stronger and proud!!! Marie’s class is a study of contrast. Your body is challenged. A lot. Every week I discover a new set of muscles that have been lying dormant for the past fifteen years and at the same time your mind and spirit are encouraged. So you feel better for waking up to those aching muscles and better for facing them in a friendly positive place. Marie is terrific. She is an exemplary trainer: she has a ” can do attitude” that supports me in meeting challenges, be they in dressage or in physical fitness. 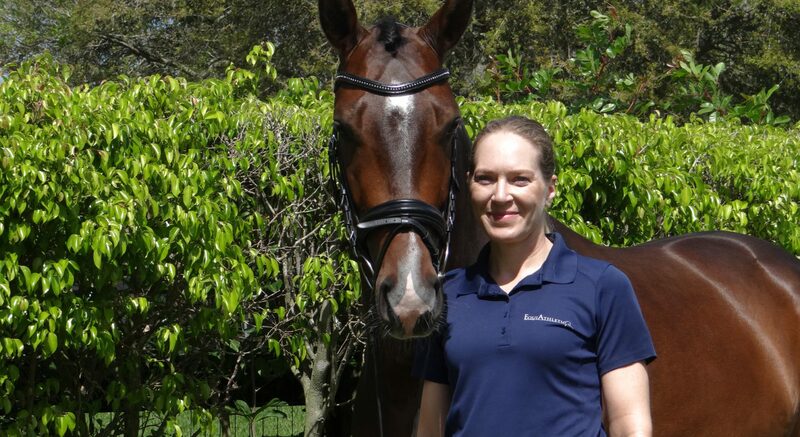 As a dressage trainer, Marie has a keen yet and can transform a ride through the subtlest of corrections. She is patient, yet she knows when to use sarcasm to great effect. While she is an exquisitely skilled and serious-minded dressage trainer, Marie also has a great sense of play. She knows how to have fun and she wants her students to have fun as they improve in their riding. She is authoritative without being the authoritarian, which gives me as the rider the confidence of knowing that she trusts my judgment. I am secure in knowing that Marie knows my riding well, knows how to help me develop as a rider and has a vision for my course as a rider. Each lesson not a discrete entity with Marie, but stands on its own within a broader vision that she has of my potential as a rider. This is true in her instruction of all her students. With my teen-aged son , for instance, it is clear that’s she has a sense of the trajectory for him, for his horse and for the two of them as a team. As a physical trainer, she is encouraging, motivating and supportive. Her class is supremely humbling and makes you strong, accomplishing exercises you might never have envisioned, much less envisioned yourself doing. In short, Marie is a talented and committed instructor, a person of integrity and an amazing rider and athlete. My son and I feel fortunate to be in her hands. Marie has been my trainer for as long as I can remember ( since I was about 5 years old). Besides being a brilliant rider, she is also an incredibly attentive and dedicated teacher. She is able to translate her extensive wealth of knowledge to riders of all ages and skill levels. I remember she used to come up with fun riding games for me as a kid, and as I got older, always pushed me to my full potential. I have ridden with other trainers and I can honestly say that none of them have helped me improve as much as Marie has. Thanx to her I now have the knowledge and confidence to teach riding lessons of my own. I feel very lucky to have worked with her for all these years! Marie’s class is like yoga: a perfect balance of strength, flexibility, light-hearted fun and self-awareness, where only positive results ensue. The tools Marie gives as a fitness instructor helps the participant find one’s seat and trust it. Each week we evolve another group of muscles specific to anchoring ourselves on a changeable source ( i.e.life/ horses). Not only does this knowledge translate to one’s riding but it influences one’s perspective on living as well. I have trained with Marie for about 6 months now and she has taught me and my pony a lot in a short period of time, she always makes it fun and comes up with new things to learn in the dressage ring! I started working out with Marie in January, By the end of January, I could feel a big difference. In February my friends and family started noticing. By March everyone was commenting on how much fitter I looked. Give Marie 12 weeks to help you with your fitness goals and you will be well on your way! Stay with her and you will make a full lifestyle change. Working out doesn’t have to be boring and repetitive . You just have to find the right trainer, Thank You Marie!!! After I moved from Toronto, Canada to New York I was looking for a new coach and I kept hearing about this lady called “Marie” and how great her riding and coaching was. Marie is a top level rider and many of her clients also ride and compete at top levels so with less than 10 years of riding experience I was worried I wouldn’t be able to get her as a coach. I am so glad she did agree. What I love is her focus on horse care, her great sense of humor, the trust she quickly builds and how inspiring and motivating she can be. She believes in my riding and knows how to get the best out of me. She grounds you in the basics and explain things really well. She is very calm and is a great confidence builder for the less experienced rider who just wants to work hard and learn. To me the improvements I have already made in my riding from just a year with Marie as my coach are incredibly satisfying. In addition I was very fortunate to have Marie help me find an amazing horse. Her advice, knowledge and experience was very valuable in finding not just an amazing horse that I am thrilled with , but also in making sure I didn’t get the wrong horse for my riding abilities and goals. I really couldn’t recommend Marie more highly. She is fabulous! !